Among the big-time rock reunions being bandied about, count this one as perhaps the strangest: late '80s-early 90s alt-metallers Faith No More have announced they're reforming for a European tour. So why is this news strange? Because besides lead singer Mike Patton, nobody knows who's in the band, that's why. Rumors of a Faith No More reunion have been rampant for several weeks, and last night a press release was issued by Patton's publicist touting "the highly anticipated reunion tour with Faith No More in Europe this summer." Although at first it was speculated that Faith No More would perform at this year's Coachella festival, that now appears not to be the case. This will be a strictly European tour. It is said that Patton won't be doing any interviews to promote the run, and as we said, it isn't clear who is in the reunited band - perhaps the lineup is still being finalized. 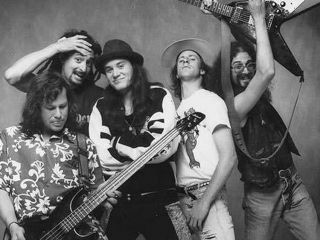 Of the original FNM members, hirsute guitarist Jim Martin left the band in the early '90s due to 'creative differences,' keyboardist Roddy Bottom split and formed Imperial Teen and drummer Mike Bordin went on to play in Ozzy Osbourne's band. No word yet on whether Martin, Bottom or Bordin are part of the Faith No More reunion. In the meantime, stroll down alt-metal memory lane with the band performing their big hit Epic in 1991.